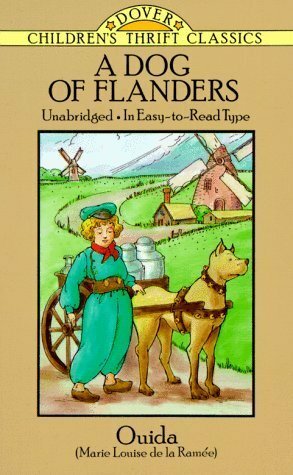 A Dog of Flanders by Marie Louise de la Ramée is a very short book that is listed in my daughter’s reading curriculum for next year. I had heard of it but never read it. It is a considered a classic, so many of you have probably read it. Since I had never read it, I thought I’d take a look. It is a moving story of a young boy, a rescued dog, and a loving grandfather. The boy, Nello, is orphaned and taken in by his poor grandfather. Together, they rescue a dog. The dog, whom they name Patrasche, shows almost human-like appreciation for their love by serving willingly to help them earn a living. Patrasche faithfully pulls a cart loaded with milk, as this is how they eek by. Nello has a great talent for art and longs to be as great as the painter, Peter Paul Rubens. Nello grows up, falls in love and seems to be making his way as an artist when he is falsely accused of starting a fire. It’s a moving story of loyalty, devotion, and respect. In case you haven’t read it, or would like to read it again, I will not divulge the ending. I will say, however, it was a surprise. I am glad I took the time (a few minutes, really) to read this book. I was brought to tears and educated on Flanders. I did not know it was part of Belguim until I read this book! I think my fifth grader will enjoy it next year, as she is an enthusiastic animal lover. Thanks for reading about what I’m reading. Levi and I watched the movie when he lived with me in the tenth grade. Later, I saw the remake of the movie. The older one is definitely better in my opinion.